Whether you’re prepping your car for a new paint job or smoothing out any bumps, dents and scratches on the body, a sander is a must-have power tool you’re going to need to get the job done. Pneumatic (air powered) or electric, dual action or a manual sanding option, large or small, there’s an ideal sander for every job, from getting off old paint for a fresh coat to dealing with a nasty scratch left by a carelessly opened car door parked next to yours. Pneumatic sanders may be more prevalent, long-used in the auto-repair industry – they pack power and speed, though lack portability, while electric sanders are becoming more of a popular choice for weekend warriors and amateur automobile enthusiasts, not just because of their greater portability but also because they’re more flexible in terms of where they can be used (unlike pneumatic sanders, which can only work properly where there is enough clean, dry air). Fitted with sandpaper of the right grit and pad size for the job, you’ll be able to undertake anything from prepping your car for priming and polish to smoothing out bumps and scratches. But which sanders work best for car body work, especially if you want to undertake some weekend sanding and polishing for a good-as-new vehicle? We’ve rounded up our top picks. Pneumatic sanders may be more prevalent, long-used in the auto-repair industry – they pack power and speed, though lack portability, while electric sanders are becoming more of a popular choice for weekend warriors and amateur automobile enthusiasts, not just because of their greater portability but also because they’re more flexible in terms of where they can be used (unlike pneumatic sanders, which can only work properly where there is enough clean, dry air). Fitted with sandpaper of the right grit and pad size for the job, you’ll be able to undertake anything from prepping your car for priming and polish to smoothing out bumps and scratches. But which sanders work best for car body work, especially if you want to undertake some weekend sanding and polishing for a good-as-new vehicle? We’ve rounded up our top picks. 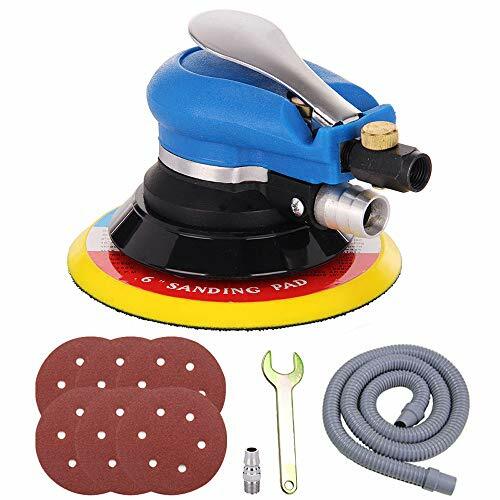 A 2-in-1 sander and polisher, this is a brilliant machine for weekend warriors and car enthusiasts who prefer to do their own detailing for their automobiles. 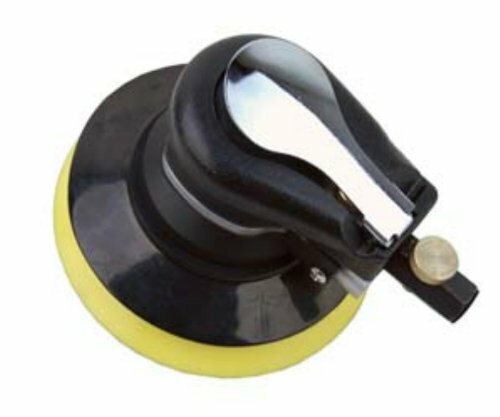 The random orbital sanding movement of the pad combines revolving and rotational movements to make for swirl-free and smooth removal of material and smoothing out of uneven surfaces, the 6-inch size of the pad fitting the ideal standards of sanders typically used in professional car body shops. Fitted with sticky back sandpaper of the right grit, you can work on removing old coats of paint for a fresh layer, or working down a rough layer of primer for that brilliant mirror shine making our vehicles look newly driven out of the showroom. An electronic unit, this sander can be fired up in your garage hooked to a plug-point, programmed with variable speed control and with a range of 2,500 to 6,800 orbits per minute (OPM), the compact weight of 6 pounds and side-handle repositioning feature allowing you to switch between right and left making it user-friendly for those of us maintaining and detailing our cars at home. A 100% ball and roller bearing construction ensures this heavy-duty machine can deliver industrial standards of performance whether used in a workshop or in your backyard. The unit is compatible with 5/16 – 24 inch spindle thread accessories, referring to the rotating axis or offset of the machine, suitable for body tech work as well. 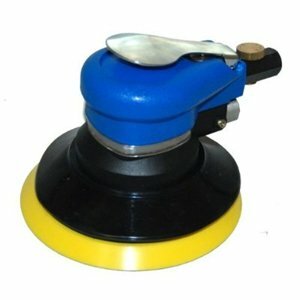 A heavy-duty pneumatic dual action sander available at a pocket-friendly price, this machine is engineered with ball bearing construction to keep it steady and prevent it from kicking back as you sand car bodies, keeping the vibrating motions steady and low for a thorough, swirl-free and smooth finish. Velcro backing pads let you switch out sandpaper of different grits depending on your needs – lower graded, coarser sandpaper is suited for evening out rough priming work or removing old paint while higher graded, finer sandpaper is appropriate for pulling off the shiny, sleek finishes once your newly applied coat of paint has dried. Compatible with 5/16-inch spindle accessories, ideal for body tech and paint work alike, the unit has a maximum speed of 10,000 RPM (revolutions per minute) with a built-in speed regulator giving you better control over the process, with an ideal working pressure of 90 PSI. A pneumatic machine armed with a 6-inch sanding pad, this roughly 3-pound sander with an ergonomic design is user-friendly thanks to an in-built speed regulator and low vibration design for perfect swirl-free finishes. The peel-and-stick (PSA) backings make it easy to attach sandpaper of the desired grit for the job at hand, boasting a maximum speed of 10,000 RPM and ideal operating pressure of 90 PSI. A durable machine with heat-treated metal parts for durability and longevity, the sander offers great value for money, ball bearing construction ensuring stability and low-vibration performance. This user-friendly sander is a pneumatic machine engineered with variable air speed control and a working pressure of 90 PSI. The random orbital sander combines the orbiting movement of a typical orbital sander with a rotating sanding pad, making for swirl-free and smooth finishes. Better suited to prepping your car body for paint by removing old coats and giving it a sleek, flawless finish, the fuss-free device is ergonomic for the ease of the user. Armed with a 6-inch vinyl face pad, the sander comes with an offset or orbit of 3/16 inches, reflecting how much surface area the sander covers with each pass, the ideal specs for pulling off immaculate paint jobs when paired with sandpaper of the right grit for each stage of the process. Weighing a little over 2.2 pounds, this unit is also on the lighter side, less of a chore to keep holding and using as you work away. The unit comes with a 3.8-inch hose with an average air consumption of 2.8 CFM (cubic feet per minute) and free speed of 10,000 RPM (revolutions per minute).